Posted January 1, 2018 by The Rapid & filed under Places to Go. Hello, 2018! Avoid cabin fear and welcome in the new year by getting out and exploring. Don’t miss this prestigious exhibition! Throughout January, visit the GRAM to take in Warhol’s celebration of America by bringing together a selection of unique paintings, prints, photographs and even film of iconic American products and symbols like Coca-Cola and the Empire State Building, of fictional characters like Superman, and of iconic Americans like Marilyn Monroe, Jackie Kennedy, Muhammad Ali and Warhol himself. The exhibition is drawn from prestigious museum collections, including the Whitney Museum of American Art, the Andy Warhol Museum, GRAM, and other public and private sources. Ride the Silver Line and Routes 6, 9, 11 and 13 to get to the GRAM. Bundle up and take a stroll through Downtown’s historic shopping districts until 8 p.m. every Tuesday. Get there via one of our fixed routes, the Silver Line (free within downtown Grand Rapids) or the free DASH buses! Start your evening with dinner and then enjoy some late night shopping entertainment. Explore all the local boutique shops, sports apparel, kitchen gifts, clothing, specialty foods, and unique gifts, salon/spa services. Various shops will have specials and other features like trunk shows, refreshments, demos and music. Routes 1, 2, 3,4, 5+ can get you there. 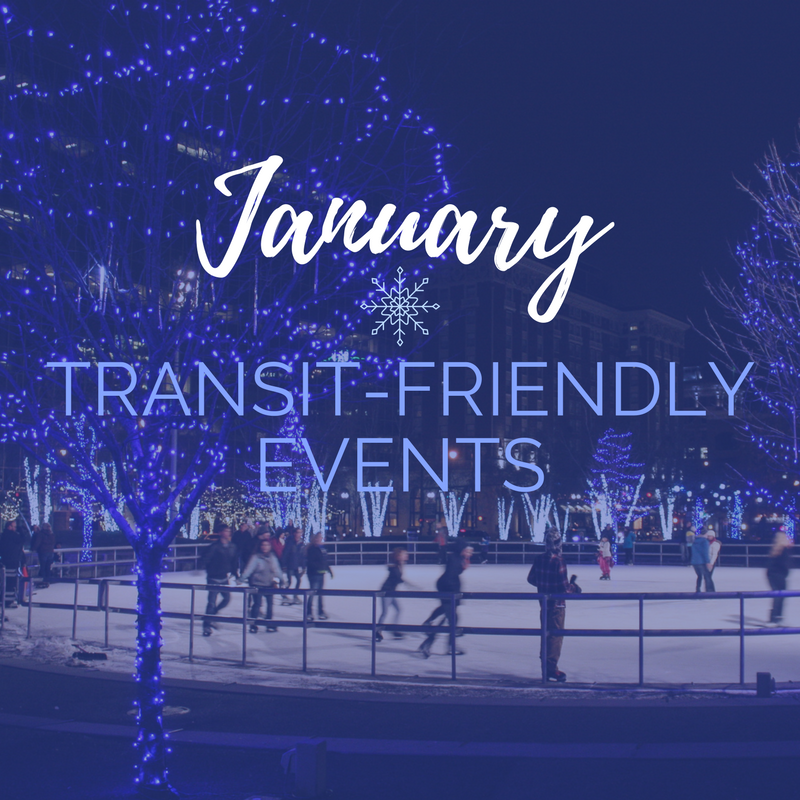 Grab your ice skates and ride The Rapid to Downtown Grand Rapids for a skate around Rosa Parks Circle. You can even purchase a season pass for just $50 for adults and $20 for youth. Routes 6, 9, 11, 13, 50 and the Silver Line can get you to Rosa Parks Circle. Do you have some things still on your wishlist after the holidays? On Jan. 6, ride Route 5 to the Wealthy Theatre to shop local vendors and discover the best products in Grand Rapids. Grab your reusable shopping tote and get ready to shop! Route 5 and 6 can get you to Wealthy Theatre. The Grand Rapids’ New Urbanism Film Festival is back on Jan. 11 at the Wealthy Theatre. Join ICCF & the Congress for New Urbanism: Michigan as we screen some of the award-winning films from the 2017 New Urbanism Film Festival in LA – including the highly anticipated feature-length film “Priced Out”. If conversations around urban planning, community building, gentrification, and/or city living fascinate you. This family-friendly event takes place on Jan. 13 at Richmond Park and Jan 27 at Mulick Park. Dress in your warmest winter gear and come out to partake in ice skating, snowshoeing, sled races snowman building contest, fat tire biking, nature walk and food trucks. This fun series that are free events in collaboration with the City of Grand Rapids Parks and Rec Department and neighborhood associations to encourage outdoor park engagement during the chilly winter months. See the full schedule of events here. Plan your trip to Richmond or Mulich Park! Need an excuse to get outside? Ride with us to Blandford Nature Center for some kid-friendly fun on Jan. 13! Whether there is snow or not, come out with you family to see if you can build a fort or shelter that can withstand a chilly winter night. This event is $3 and requires pre-registration. Visit the Downtown Market on Jan. 20 to experience the outdoors! Come get up close and personal with animals, learn interesting facts about their habitats and enjoy Greenhouse activities. This family-friendly event is free to attend and all ages are welcome. Route 1, 2, and the Silver Line can get you there. Catch some tunes by Matt Gabriel at the Kentwood Library on Jan. 18. This singer/songwriter performs folk and blues tunes we know you will enjoy. Grab a bite at the Patty Matters Food Truck while you’re there. You can also bring your own beer or wine to enjoy at the show! Get to the Kentwood Library via Route 2 or 44. Beat cabin fever by taking your family to DeVos Place on Jan. 27! There will be loads of crafts, games, play stations, costumed characters and even a zip line. This event is $7 to attend. Purchase your tickets at the door or online here. Located near Routes 11, 15, 50 and the Silver Line.